This page contains some information about myself, including such things as current research areas, addresses, and more. For a list of some of my most frequently followed links, click here . To see some of my favorite pictures, click here. Finally, for my official university homepage, click here. I am a Professor in the Department of Systems and Computer Engineering at Carleton University in Ottawa. The focus of my research activities so far has been in the area of distributed and parallel systems. I examined issues in load-balancing while staying as exchange student at the University of Illinois, Urbana-Champaign, in 1988/89. My master's thesis dealt with distributed object-oriented programming languages. My Ph.D. research addresses the behaviour visualization of distributed and parallel applications to facilitate the program understanding task, for example during distributed debugging. More recently, I shifted my focus on issues in wireless networks and mobile computing. A postscript version of my current curriculum vitae, including a complete list of my publications, can be found here. I also wrote a more detailed description of the various research projects I have been involved in over time in April 1997. This document describes the projects and points out the resulting publications. The document is available either as postscript file or (in a slightly formatted form) as HTML document. After mastering the joys of PowerPoint :-), I prepared the course notes for a 2-day short course on Wireless and Mobile Computing. More information about this course (and postscript versions of the slides) can be found here. I graduated from the Computer Science Department of the Technical University of Darmstadt (THD) with a Ph.D. (Dr. Ing.) in Computer Science in May 1994. I worked as a research associate in the Automaton Theory and Formal Languages group, my supervisor headed the Systems Programming group. The University is located in the city of Darmstadt , Federal Republic of Germany. The university logo shows Pallas Athene, the Greek goddess of wisdom. Compared to other German universities, THD is considered to be comparatively young (certainly much younger than the traditional universities such as Heidelberg and others founded in the Medieval Ages). However, in Canada, it would be considered to be rather old, being promoted to full university status in 1877 (it started out as an engineering school, a bias which still shows in the number of students and degree programs offered in engineering disciplines). 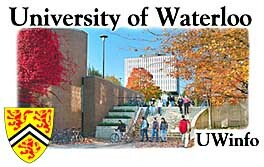 I was a faculty member (Assistant Professor) in the Department of Computer Science at the University of Waterloo, Ontario, Canada, from 1994-1997. During this time, I was part of the Shoshin Distributed Systems Group. Starting Fall 1997, I joined the Department of Systems and Computer Engineering at Carleton University in Ottawa as assistant professor.